Running enthusiasts will converge on Saturday (December 3) for the Jingle Bell Run in Fort Worth. This 5K run raises funds for the Arthritis Foundation, and, as you may know, arthritic conditions can affect your foot and ankle health in a major way. If you are participating in this event, we hope you have a fun, safe time! Of course, when you run—no matter if you participate in the Arthritis Foundation’s Jingle Bell Run or not—it is important to make sure that you find the right running shoes first. Now, “the right” running shoes doesn’t mean “the ones next to your left running shoes.” Instead, we are talking about shoes that work best for you. There are other potential problems as well, but when you find the right running shoes your risk factor for these issues will decrease. So what do you need to look for in your footwear? Proper fit. Your heels should be cradled firmly, but with a little room between the shoe and the back of your foot. As a general rule, you should be able to slide your finger down the back to about the second knuckle when the shoe is laced. Also, your toes should be able to wiggle freely and have a little room between them and the front. About a thumb’s width of space between the longest toe and front of the shoe is ideal. Accommodation for your running style. Running shoes are engineered to work with various pronation patterns, so make sure you know yours (moderate, overpronation, or supination). Not sure which you have? We can perform a gait analysis for you! Solid build. 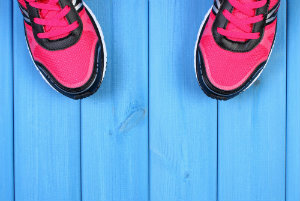 Running shoes need to be well-constructed and provide ample arch support and cushioning in the heel area. Durability is important if you are logging lots of miles. The shoes should have some flexibility, but not at the expense of the support they offer your feet. These three tips are a great starting point when you need to find the right running shoes, but remember that we are here for you as well. If you have any questions or need further assistance, simply contact Richardson Podiatry Center at (972) 690-5374 or, even better, come see us at our Richardson, TX office.